 with ZweigWhite Publishing and Amanda Walter is due out this Fall 2011. Corporate Social Media Marketing Strategies and Staff Training designed especially for your business goals. When planned and implemented strategically, your social media outreach can become your company's most powerful, and cost-effective communication channel to potential customers, existing clients, the media, business partners and the public as a whole. Holly Berkley is a frequent guest on TV news and Business Talk Radio shows discussing New Media marketing trends. Click to see Holly Berkley's recent media coverage. New social networking trends, web sites and tools are emerging almost daily. The expansiveness of this landscape can overwhelm even the best intentions if it isn't approached with a clear goal in mind. 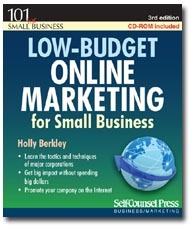 Professional online marketing strategist Holly Berkley, has developed a 3-month program to help firms like yours craft a social media presence that ties directly into your existing initiatives or goals - whether a PR and marketing campaign, a thought leadership program, research and development, customer service enhancement, recruiting or whatever your company's primary marketing business objective may be. Today's social media channels can function as a powerful communications tool that can be instrumental in advancing you toward your business objectives. Contact Holly Berkley to learn more about how she can help enhance your company's social media outreach program. Holly Berkley worked with Verizon to enhance its Online Customer Support Community with the primary goal of deflecting support calls. The online community saves the company millions each year in traditional customer support costs. Her background in training includes development of Interactive Marketing courses and workshops, including the Internet Marketing course she built and continues to teach at San Diego State University. She has also authored several business marketing books, many which are required reading at schools across the world. In addition to corporate social media training, she also continues to help all size businesses increase online sales, strengthen their overall brand, and dramatically boost web site traffic through proven online marketing concepts.